If your phone is also your primary music player, the Rezound is worth a look, if only for the included earbuds. 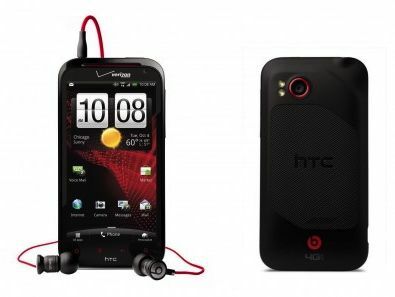 The Rezound by HTC is first US handset to feature Dr. Dre's Beats Audio technology. That's probably what catches your eye first, but with its 720p HD display, super-fast 4G data, and speedy dual-core processor, the Rezound is certainly more than a one-hit wonder. The phone features a 1.5Ghz Dual-core Qualcomm MSM8660 Snapdragon processor, backed by 1GB of RAM. On the storage end, the Rezound features 16GB of internal storage, plus a bundled 16GB MicroSD card. The 4.3-inch 1280x720 screen supports full 720HD resolution. The Rezound connects to Verizon's 4G LTE network for blazing fast data speeds. Despite its rather large size, it feels good in the hand. At 5.08 x 2.58 x .54 inches, it's bulkier than other phones on the market, but it still slides into a (largish) pocket easily. Aesthetically, the phone is kept sleek and simple. The top features a 3.5mm headset jack and the Power/Lock button. Down the phone's left side is a volume rocker, and the right has the MHL port for charging and moving data. The rubberized back features ridges for grip, as well as the camera lens and dual-led flash. The built-in speaker is also integrated into the design of the ridges along the phone's removable back. While the design is clean and streamlined, the Rezound is a perfect example of a device that's a bit too clean for its own good. The Power/Lock and Volume buttons are mounted flush with the casing, a placement that looks good in photographs, but isn't exactly user friendly. The flush buttons are hard to find by feel, and they don't travel much, making them difficult to operate as well. Perhaps the most noticeable (and notable) feature of the HTC Rezound is the prominent Beats Audio logo on the back, advertising the Dr. Dre-endorsed audio processing baked into the phone. The Rezound is the first Beats-branded phone from HTC available in the United States. We'll get into the audio quality in a bit, but suffice to say, the Rezound definitely brings the booming bottom-end that's often missing in portable players. This is helped greatly by the included pair of ibeats in-ear headphones, which retail separately for $120. When the custom audio hardware and software combine, the result will be pleasing to fans of the driving rhythms of rock and hip-hop music, although purists may hear a few off notes. Given the difficulty in using the Rezound's flush-mounted volume rocker, we'd have liked to see inline volume controls, although you can play/pause and navigate forward or back through track lists with the three-button inline remote. The rubberized back of the Rezound pops off to reveal signature bright red internals. From there, you can access the removable battery (handy for an LTE phone), as well as the MicroSD card slot and SIM card.